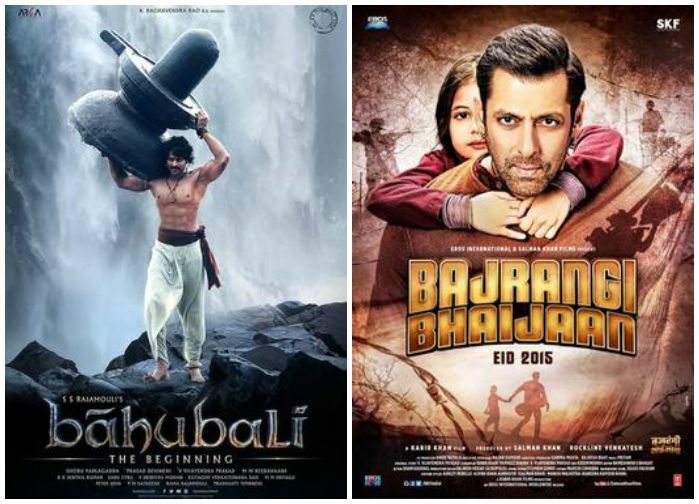 Bahubaali and Bajrangi Bhaijaan are two tent pole Indian films which have been doing well. Both the films have received critical as well as commercial acclaim. My attempt here would be to put these 2 films into current political context and see if both films succeed in making a social commentary on the current nature of our Nation. There is a scene in Baahubali where it shows soldiers forcefully taking away jewellery and gold items from citizens of fictional town Mahishmati for the government. I could not help thinking about the current controversy where government is trying to enforce Land Bill, where in the name of reforms scores of people will lose their lands, I have always wondered who decides what is this greater good which the government peddles to us. Who owns the land, does government even have right to take away land of its citizens? The second scene comes right before the interval, where a statue of BhallalaDeva the ruler is to be installed, showing his greatness. The camera lingers on the wounds of the workers, making us wonder while we may look and marvel at beautiful structures, the process to build it is always tiresome and filled with injustice. Look at the plight of our people who work in the construction industry in high rises. Do they even get basic safety gears, medical facility and so on? India ranks number one in the death of construction workers. The worthless aspect and vulgarity of building the statue is established by people chanting not the present king’s name, but the name of the former prince Baahubali. Similarly now we have two massive statues coming up in the states of Maharashtra and Gujarat, do we need these statues? The answer is resounding no, a better idea to honour the memory of leaders would be to build a school or hospital which will provide benefit to society. Baahubali may be set in fantasy land, but the political context it provides is contemporary. I feel this may be one of the reasons why it has struck a chord with the audience. The first actor to understand the power of cinema, and use his star image for political gains was NTR, and later on MGR in TN. Likewise here we have Salman Khan lately who has been using his roles to whitewash his image. Take the example of Jai Ho where he played the role of a good samaritan who helps people. Or Devi Lal in Kick who risks his life to save children. Bajrangi Bhaijaan is another attempt to bolster the image of Salman Khan, in the meantime it is also a stunning reflection of our Indian society. It must be noted that the relation between a girl child and hero has been recurring motif in K,V,Vijayendra Prasad his films, in his own directorial venture Rajanna, the girl travels from southern India to meet Nehru the P.M. of India, in Vikramarkudu it is a stranger who again rescues and helps a girl child and now Bajrangi Bhaijaan traces the story of a Pakistani child who meets a Hindu fanatic. Bajrangi (Salman Khan) is raised in RSS household, even though he is a do gooder, his distrust for Muslims is something which he has ingrained from his father and surroundings. Like most so called flag bearers of Hindu religion, Bajrangi has never bothered to read religious scripture of Hinduism. He has watched Mahabharata, one of Hindu religion’s epics on TV. The brilliance of Kabir Khan lies in making the character of Bajrangi endearing to the audience, then slowly stripping of his layer or goodness. Bajrangi assumes that everyone whose skin is fair is Brahmin, for him no other caste exists, when he finds out the girl child eats chicken. He assumes she is Kshatriya. It is interesting to note that Baahubali which is also written by the same writer makes strong anti-caste statement. In a scene where Baahubali asks Kattappa who belongs to Nadar Community a lower caste in India to feed him. Bajrangi is a character that we all know. We all pretend to be progressive Indians, but we know an uncle, aunty our friends who in the confines of their house curse other caste and feel they are superior. The irony is in India we even have hierarchy even among lower castes. In another scene, we see the girl child is made to sit on separate table just because she is eating non-veg. In one of India’s so called metro city Bombay/Mumbai you won’t get a residence to stay easily because you eat non-veg. In India, many states have banned beef this shows how government disregards the dietary habit and choice of people and send across the message why meat is not good. You can read about how people are targeted on basis of their dietary habits here. Bajrangi in a scene apologises to Hindu Lord Hanuma as a child enters a mosque. Bajrangi mentions to God that a child does not understand the difference. It is another brilliant sequence from the film which makes us think. Do we have right to impose our religious beliefs and practices on our children. When Shahida (Harshali Malhotra) prays, it is not an act of a faith, but for her it matter of comfort and getting close to her mother. It is in its third act when film hammers home its message, that the hate and animosity among people is created by politicians and bureaucrats. The love for the child makes Bajrangi enter a dargah, just like her mother did for her. As Bajrangi interacts with Pakistan as a country and Pakistanis he realises that all of us are the same. It has similar looking fields, the same passion for wrestling and even has Kashmir within its boundaries. As someone said the greatest virtue of our country is despite all these differences and distrust is our level of tolerance for others. It is what makes us such a great country. Do we need to go for another war, do we need another statue or bigger tank? Or is what we need education and a little bit of love so that we can remove those electrical fences and those lines of distrust for others among in our hearts. When Bajrangi Bhaijaan ends, he and Shahida are in a no man’s land. Hopefully one day they would need no visa. very nicely written, Ash, and very valid points as well.